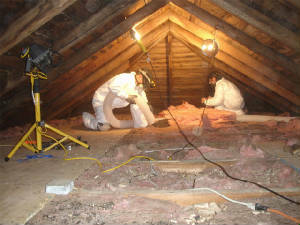 We Can Provide Service and Repairs That MAY BE COVERED Under Your Home Owner's Insurance For Damage Cause By Wildlife. Please, Call If You Have Any Questions And Ask For Ken. Please remember when dealing with a Wildlife problem, it is always advisable to contact a professional, such as ourselves, for Safety and Health Reasons before you attempt to resolve any problem that might be present. Always remember that your dealing with a WILD ANIMAL and your health and your families health MUST BE your 1st concern.